Miami, FL is a truly unique destination. Travelers from across the world embark on a journey to visit this beautiful destination. While many spend time on the wonderful sandy beaches, there is a wide variety of outdoor activities you can experience. Join our local experts on a Miami Bass Fishing Experience to help create memories of a lifetime! Miami Bass Fishing is by far the best way to experience Miami, FL. Whether you are after peacock bass or largemouth bass, you can encounter it all. The Florida Everglades is a short drive your destination allowing for exceptional largemouth bass fishing. 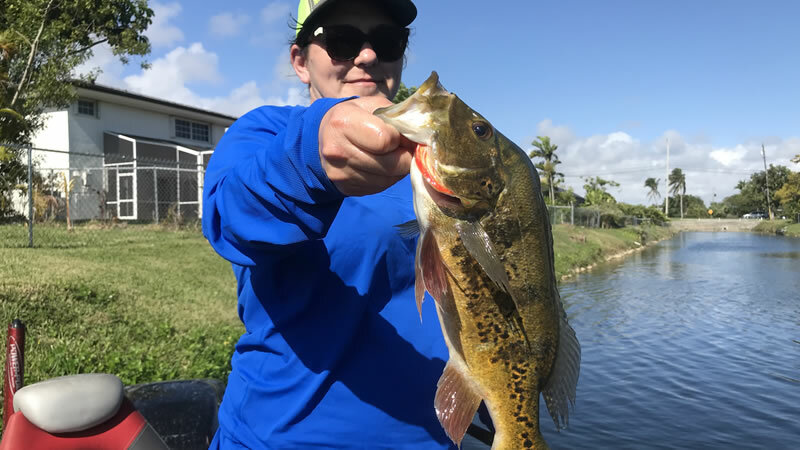 Miami bass fishing is dominated with Florida peacock bass. These colorful hard-fighting bass will have you excited and amazed with every catch. 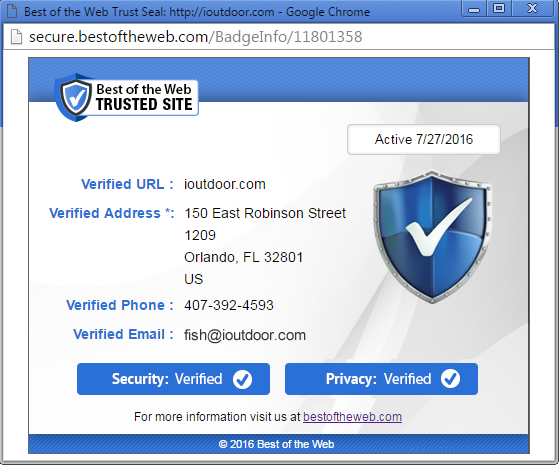 Captain Joe Gruny is one of our local experts in Miami and South Florida. You can explore largemouth bass fishing or peacock bass fishing with Captain Joe. Years of experience and knowledge has led to providing an exceptional fishing charter. Captain Joe had the pleasure of fishing with repeat client Ledford Gillespie and his wife Chalayne. They were traveling from Louisiana looking to explore what Florida Bass Fishing had to offer. Peacock bass and largemouth bass were on the menu for this wonderful couple. They love to get out in the outdoors and experience something new on every travel adventure. Ledford and Chalayne spent three days of fishing with Captain Joe. The first fishing charter was located in the Florida Everglades for largemouth bass. Long stretches of canal, constant action and lots of wildlife make for an awesome adventure. 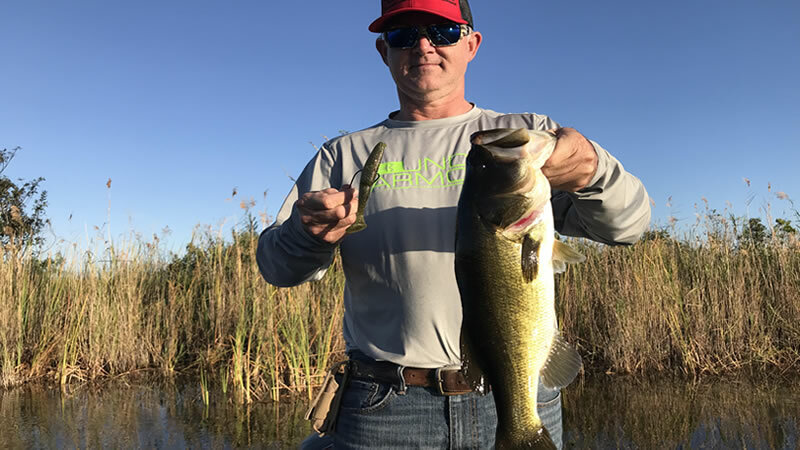 All the fishing in the Everglades is dominated with artificial baits. They caught over 35 largemouth bass with the biggest fish weighing in at 5-pounds. Most of the other fish were cookie cutter 1-2 pound bass. When you catch great numbers like that, you truly can’t go wrong. Most of the bass were caught on Big Ez swimbait along with flukes, poppers, and senkos. The next day brought about a much different fishing trip. This time, they adventure down into the Miami Airport Lakes or Blue Lagoon. If you are looking for a fantastic fishery close to an airport, this is your destination. Ledford and Chalayne had a blast on this fishing charter for Miami Peacock Bass. After catching several nice peacock bass, Ledford hooked into something really big. The drag was screaming and the fish was shaking its head. 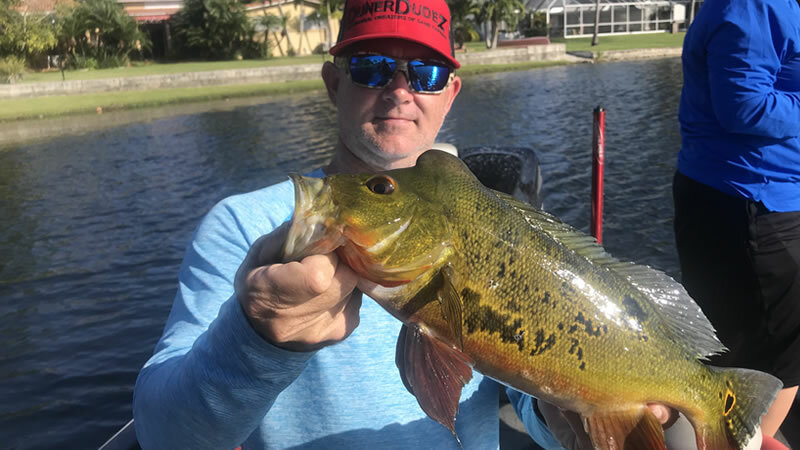 Peacock bass are a smart species and know how to get themselves off the hook. This peacock found some tree structure and snapped the line with its strength. Fishing is Fishing and you just can’t change that. After this fight, it got them fired up for their next location. Just shortly after this trip, Ledford and Chalayne explored the Miami Falls Canal System. The Falls are truly unique. You have the opportunity to travel through long stretches of urban canals with clear water. Enjoy watching the fish swim by and iguanas on the bank sunbathing. It is a relaxing environment suitable for some amazing fishing. The bite was strong on this fishing trip. After moving to several spots, Captain Joe found a nice pod of them. Ledford and Chalayne landed over 15 peacock bass with the biggest weighing close to 3 pounds. According to Captain Joe, these were amazing people to take out fishing. They had such a warm personality and I could not have enjoyed their company more. Captain Joe is looking forward to their next adventure in South Florida. When the weather gets warmer, the bass will bite better. 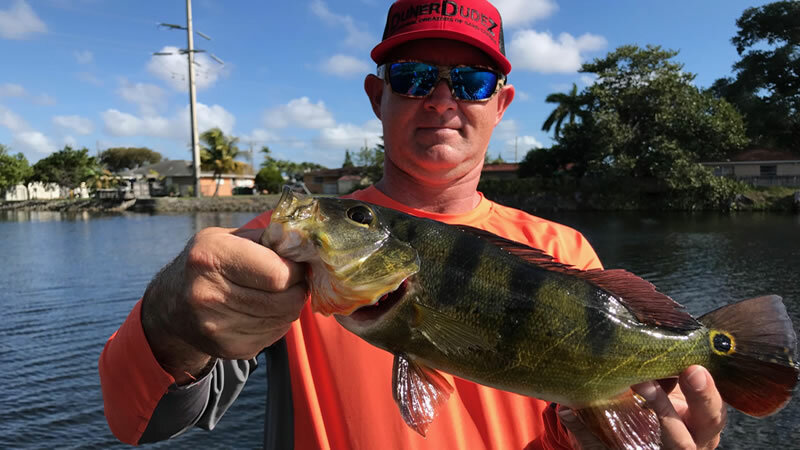 Don’t miss out on your fishing adventure right here in Miami, FL. You never know what will bite the end of your line. Let’s get you hooked up on a fishing experience of a lifetime. Our local experts would be honored to show you around. We look forward to seeing you on the water next time!